This is a beautiful, bayfront, non-smoking, single-family 5-bedrooms home located in a quiet private lane in Loveladies, the family-oriented region of the Long Beach Island. 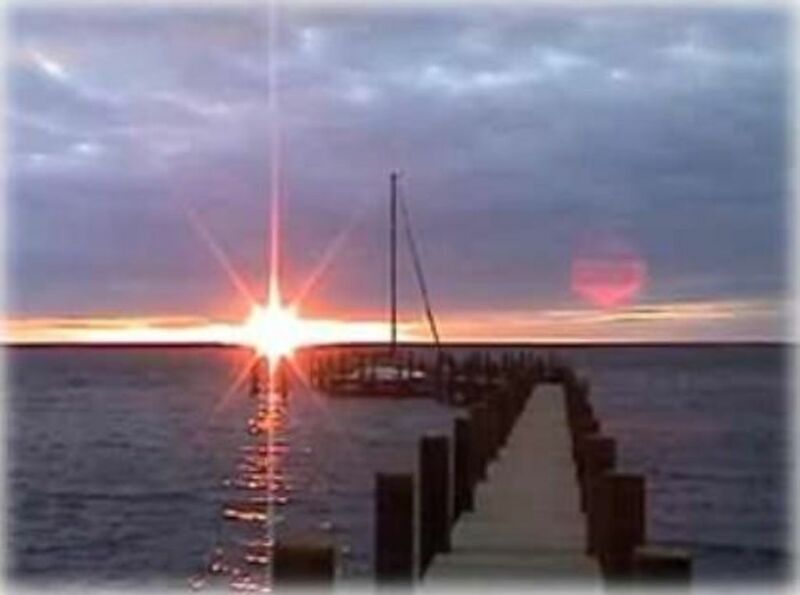 Its 125 feet wide private beach with a 240-foot private dock leads into Barnegat Bay with a stunning, unobstructed sunset view. Few stone-throw away, yachts and sport fishermen parade in the Intercoastal Waterway to and from the Barnegat Inlet. (No beach badge provided). The historic Barnegat Lighthouse in the back drop of the beautiful sandy beach of the Atlantic Ocean, which is only a short walk (500 yards) away. Optional deep private water slips allow boaters to dock their boat right in front of the house (additional charge). A public tennis court is located 200 yards south of the house on the ocean side. Few miles south on the island are the town centers for Harvey Cedar, Surf City, Ship Bottom, Brant Beach, and Beach Heaven. These centers features restaurants, shops, equipment rental, amusement park, miniature golf, theaters, and various services. Each of the four bedrooms in the house has its own deck. The master bedroom is on a second floor loft. The full-size gourmet kitchen features a breakfast island and a serving counter for the bay front deck. Sunlight shines through two large skylights on the top of the cathedral ceiling into the living room. This house is situated in a gorgeous cove with a unobstructed view of the bay. You can easily lunch your water toys from your own private, protective bay front beach. Or you can lunch your larger vessel from the nearby marina. Enjoy the sunrise view on the horizon while Doing your morning jogging on the beautiful white sandy ocean beach. The house provides everything you need to make your dream of a perfect summer New Jersey Island Shore vacation come true! Waterfront, not Lake/Oceanfront. Ask for details. Parking for RV/Boat/Trailer. Other Amenities: Cathedral Ceiling, Skylights, Multiple Decking, Central Heating and Air Conditioning, Broadband Wireless Internet Connection, Full Kitchen with double ovens, no smoking and no pet, Linens for 2 queen size, 1 full size and 4 twin size beds are not provided, Use of boat slip optional with additional charge. Master bedroom great view bathroom recently remodeled, best room in the house. A king bed would make it five stars. The patio has plenty of lounge chairs, patio tables, needs a better umbrella the setting sun is intense out back, the bay and dock is a great escape for the kids after several days at the beach. The kitchen has all the utensils you need, plates bowls etc...large island and two dining tables can serve 12 at one time...the three bedrooms each have two well worn twin beds...the kids did not complain and a new queen pull out sofa bed in the living room..there is a loft...Japanese matt with two single mattresses in it good for over flow guests, AC and lighting was good..plenty of parking you are the last house on the street right on the bay. Great view somewhat encumbered by the cat tails growing at the waters edge...a lot to like about the house...would book it again. Can accommodate two adults and ten kids...wouldn’t put adults in any rooms except for the master on the second floor...it was perfect for our situation. Great little parking lot one block south no permit necessary. Super convenient to get to the beach. Wonderful vacation had while staying at this home, nice quiet location - very close to Barnegat lighthouse! Large deck with beautiful view and sunsets were breathtaking. The dock off the house is super convenient the kids loved the dock they spent plenty of time fishing and crabbing. We even caught seahorses off the dock! Lovely vacation home and very relaxing. Perfect holiday weekend home away from home. My friends and I stayed here over memorial day weekend and it could not be more than we'd asked for. Beautiful private dock with stunning sunset views - reminded me of "Sitting on the Dock of the Bay." Huge deck for sunbathing and outdoor meal gatherings and lofty open space living room. It was the perfect home to kick back, relax and enjoy the quaint loveliness of LBI. Nothing is more rewarding than knowing our renters have a great time at the house. Thank you so much for your kind words. This season we have added a Japanese room with tatami floor, which is adjacent to the master bedroom on the second floor. I am sure you would love it! Loveladies, LBI, Long Beach Island, 5-Bedrooms Bay front with 240 feet private dock and boat slips, 40 min North of Atlantic City. Other Activities: Shopping, Boating, Wildlife Viewing, Miniature golf, Kayaking, Shelling, Parasailing, Private Bay Beach, Private 240 feet Boat Docks, Crabbing.